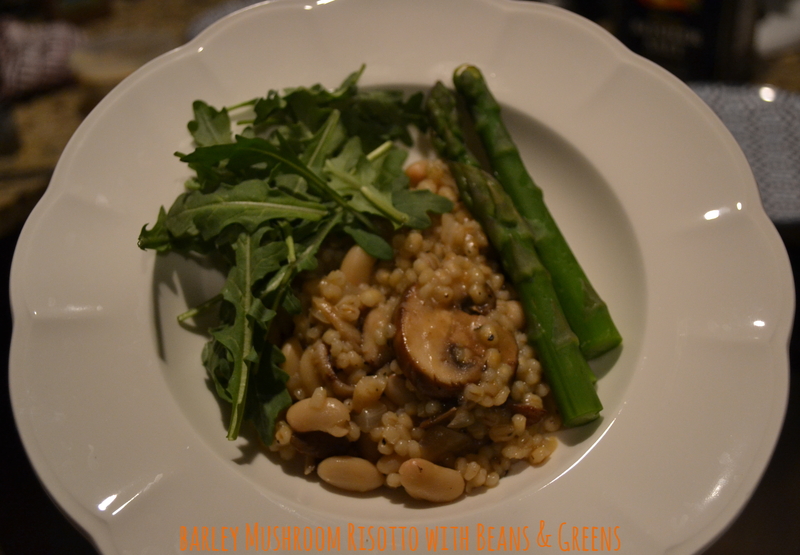 Mushrooms, and barley, and beans, oh my! The best thing about this risotto is it’s hands on, but mind off. As long as you nail the basic barley to broth ratio and are committed to stirring like crazy, it’s pretty hard to mess this up. Ease aside, don’t under-estimate this dish as a secret weapon for a weekday dinner party. Risotto screams “fancy-labor-of-love”, so any guests would be trés impressed by your rustic, rich, flavorful, faux-fancy feast. It’s the perfect post-work dish when your brain’s drained and your tummy’s grumbling, and it messies minimal dishes. 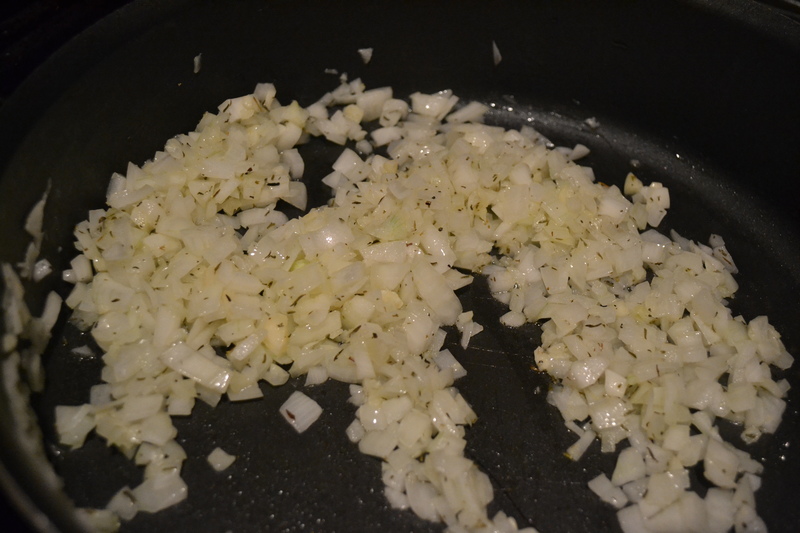 Start by sautéing your onions in olive oil, stir for about 1 minute and then add your garlic and two tablespoons of butter. Add your thyme and continue cooking until onions become soft and fragrant (note: I love onions and was eating sans Boston Boy who does not, if your dining with folks who curl their nose at a lot of onions I recommend using half a chopped onion). While your onion and garlic are softening, pour your quart of veggie stock into a large pot and bring it to a borderline simmer. 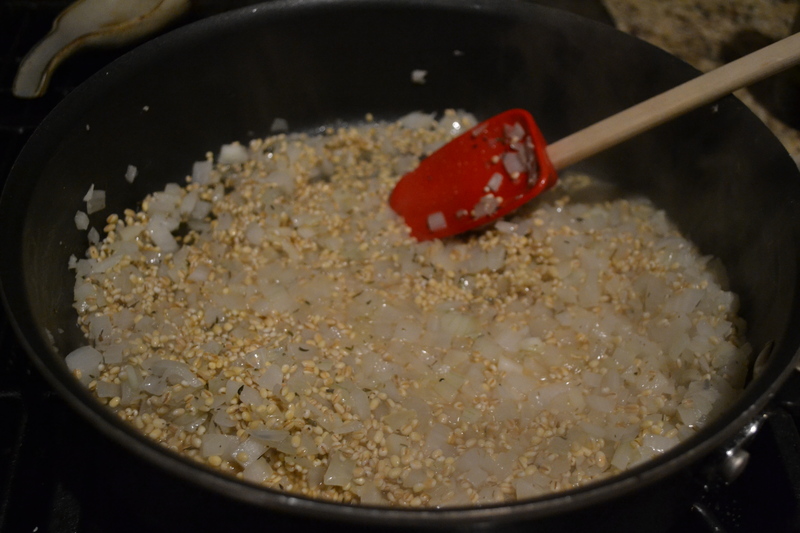 Add your barley to the pan and stir it around until all ingredients are combined, about 90 seconds. 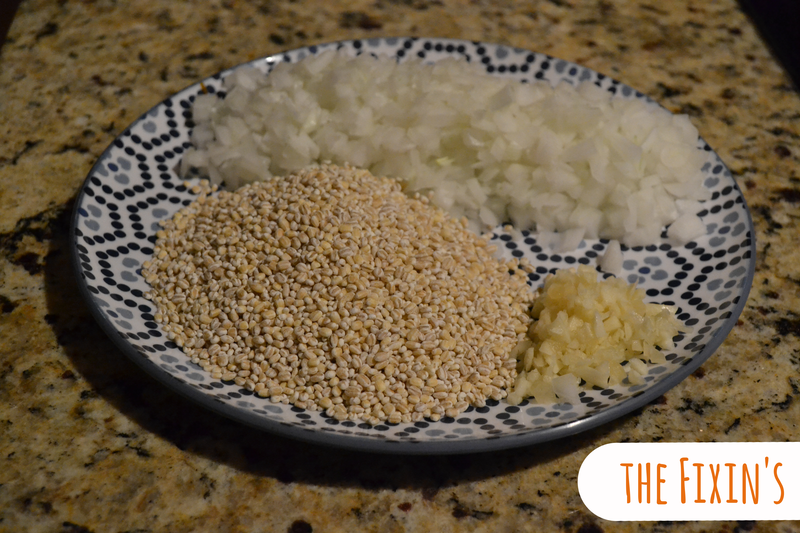 Add a sprinkle of salt to flavor your barley. Then, start ladling in your hot broth to the barley mixture. Add broth one ladle at a time until all the broth is absorbed (this is where it’s nice to start zoning out and stirring, or in my case carrying on a great conversation with One Sock Wonder). Once you reach the point where you’re almost out of broth in your broth pot, lower the heat slightly on your risotto mixture and slow your stir. I do this mainly out of necessity to free my hands to prep my other veggies. Sauté mushrooms (I used a mix of oyster, baby bella, and shiitake, yum!) in two tablespoons of butter and season with salt and pepper. Once browned and cooked, transfer your mushrooms into the risotto mixture (hopefully the risotto is still a little soupy and has some liquid to absorb). Stir in your white beans to the mix. Next, chop your asparagus in half (hamburger style) and then blanch it, so it maintains a nice crunch in the risotto. Continue stirring your risotto until most of the final ladle of liquid is absorbed and then add your parmesan cheese, season with salt & pepper. Stir in until the cheese melts and give it a taste. You want your risotto to be slightly al dente. 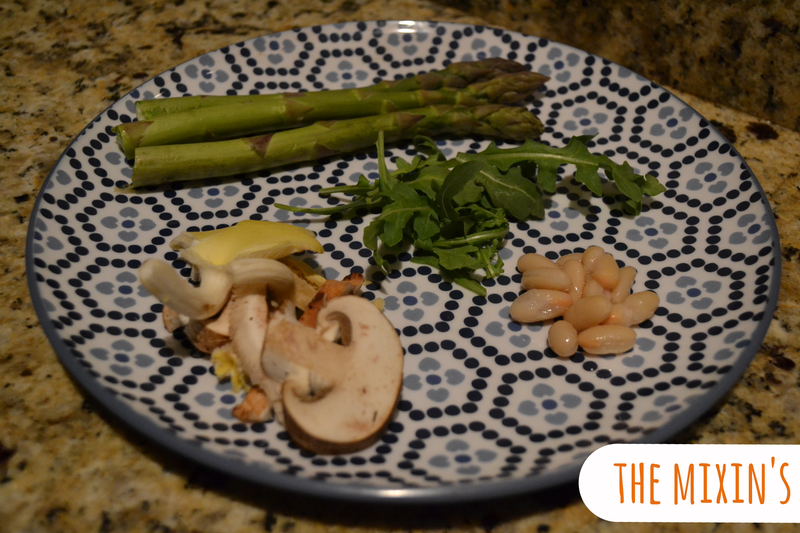 Once it reaches desired consistency, remove from heat and plate with asparagus and arugula. The beauty of this recipe is you can improvise with whatever’s on hand – innovate with your beans and greens – use the barley as the base and get weird with whatever ingredients you feel like or have on hand. With the right fixin’s, this dish will be delish with any mixin’s. Yum! I did a similar version over on my blog http://whatdresscodeblog.com/2013/02/26/recipe-risotto-style-barley-with-mushrooms-and-spinach/ — don’t you love the barley-as-risotto spin! Yum! I did a similar variation over on my blog (http://whatdresscodeblog.com/2013/02/26/recipe-risotto-style-barley-with-mushrooms-and-spinach/) don’t you love the barley-as-risotto spin! Yum, Liz! Great minds think alike. Love your post. Terrific idea with the barley, a thought…. Why not toss the Arugula into the risotto at the last minute to infuse the peppery wonder leaf into the mix….? Wilted greens are the rage…. !